Add Cystex® Urinary Health Maintenance to your favorite foods or drinks and suddenly that normal snack has become a powerful force for wellness. We’ve got 8 easy ways to incorporate Cystex® Urinary Health Maintenance into your daily diet. Staring down the tablespoon again? Sure, you can take your daily dose of Cystex® Urinary Health Maintenance in one big gulp. Just fill the cap to the line, or whip out Mom’s old measuring spoon, down the hatch, and you’re on your way to helping your urinary system stay in tip-top shape. But for those of us who still need a spoonful of sugar to help such things go down, there’s great news. Cystex® Urinary Health Maintenance is easy to slip into your everyday diet. Add Cystex® Urinary Health Maintenance to your favorite foods or drinks and suddenly that normal snack has become a powerful force for urinary wellness. Smoothies, especially berry smoothies, which pack an antioxidant punch and blend with Cystex® Urinary Health Maintenance tastily. Hot herbal teas including cranberry, raspberry, mixed berry, and pomegranate teas. Relaxation just got a health boost. Cold “iced” teas especially in flavors like those mentioned above. No one needs to know that as you sip, you’re taking care of your urinary system. Yogurt and yogurt smoothies. Again, look to berry flavors for the smoothest taste. Sensing a trend? Red is the new black. Cranberry juice or cranberry juice blends. Great with ice or a splash of sparkling water. 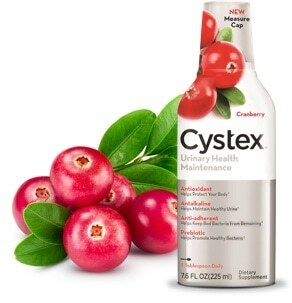 No great surprise, Cystex® Urinary Health Maintenance and cranberry juice go perfectly together. Sparkling water. Hydration in itself is important for urinary health, add Cystex® Urinary Health Maintenance and double-down for urinary sake. Unsweetened applesauce or strawberry applesauce. No, applesauce is not just for kids. It’s full of healthy fiber and vitamin C, is nonfat, low–calorie, and makes a nice change of pace in the morning. For protein, sprinkle almonds on top and breakfast is D-O-N-E.
Cherry cola. Who still drinks soda? Never mind. Just know that if you’re tempted to sneak a soda pick-me-up, you can at least get something good out of it by adding Cystex® Urinary Health Maintenance. Prebiotics – to help promote healthy bacteria. Cystex® Urinary Health Maintenance is lactose-, gluten- and sugar-free, and is just one calorie per tablespoon. Think you may have a urinary tract infection (UTI)? Learn about UTI symptoms and talk to a healthcare professional right away. The only cure for a urinary tract infection is a prescription antibiotic. While you wait for your appointment, your prescription, or for treatment to start working, reach for Cystex® Urinary Pain Relief Tablets to ease UTI discomfort and to help keep infections from getting worse. Got another great way to make Cystex® Urinary Health Maintenance part of your daily diet? Share it! Bromelain. WebMD website. Accessed May 24, 2017. Cranberry. National Institutes of Health website. Accessed May 24, 2017. D-Mannose. WebMD website. Accessed May 24, 2017. Fructo–Oligosaccharides. WebMD website. Accessed May 24, 2017. Vitamin C. National Institutes of Health website. Accessed May 24, 2017.